Sure it goes faster for gaming models using the same brownish tone everywhere, some changes here can make the difference. Just hit your basic colour (i guess Bleached Bone) with some difference, mix in a tiny drop of dark brown or a tip of blue or red or whatever you like. This makes the unit even more looking more like the savages they are. Then hit your groundwork with a wash like you did, you can also bring in difference here by just mixing in, for example a dark brown into your cryphone sepia or devlan mud. Just to make different material look like different material. "... and that is a tutorial on something very basic, namely figures presented as being in the dark with a single lightsource. Take "Fat Fergus the wandering friar" in the Aenglish line from marvelous Red Box for example. 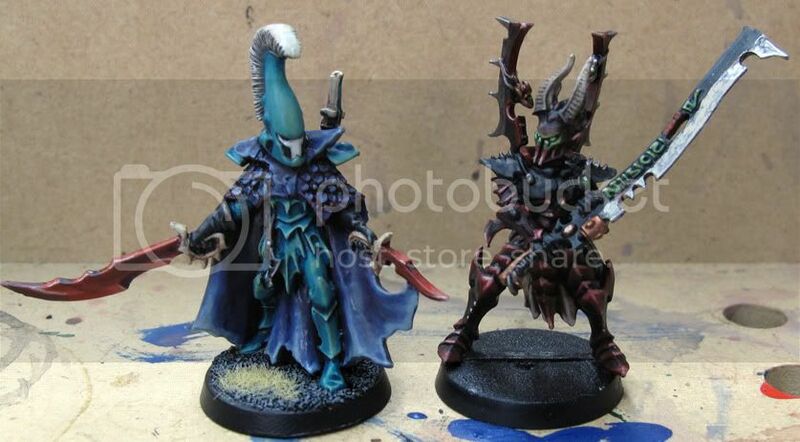 Figures like these have become more common in my opinion, and just beg for being painted like they were in the dark. Unfortunately, the step from just painting a figure like you feel like, to painting someone in the dark, feels like a HUGE leap. Perhaps it is? 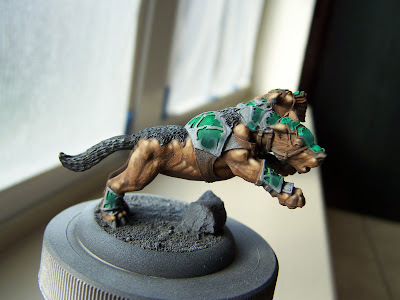 At least, I'd have to study like a possessed regarding OSL and techniques for highlighting colors specifically for someone in the dark etc. and the end result would probably not be worth it. Actually, I've tried and failed miserably a few times haha. So I just thought I'd mention that such a tutorial or just a step-by-step "this is how I painted a figure in the dark" would be very helpful in making figures like that accesable to the mainstream painters. Oh yes, there is still much missing in the article section. 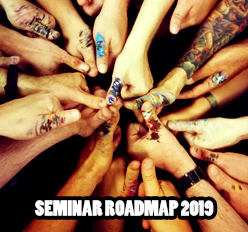 Basics, Colour Theory and so many stuff we plan and could tell. In fact we need way more time every day, so i would ask for more patience. It comes as it comes. Maybe the article about basic OSL or Raffa's light explanation helps you to find your way to this topic. What also could help is that you take a photo of the miniature in the dark in front of a candle - so you could paint from the photo how your light situation is suited to the miniature. Sorry for such an low level answer, but there is always much work i have to attend to and i can't write articles very much these days - even i have a lot in my backpack and ready to post, but time to write them is needed. Many thanks for your nice words about the jungle! tutorials on Massivevoodoo pages they are very helpful. I have only one question. Can you give me some advices about hair painting? If You have some nice tricks. Or some guidence for beginer. How to do some basic type of hairs: blonde, black, red. With kindly regards Black "
It is all out there, you just have to open your eyes. "I don't know if you remember me, but a while back I e-mailed you a picture of a space marine in white armor. It was my first display piece, but not my first mini. Since then I've really jumped into my painting feat first. Here is a wip of a model I'm working on. Any constructive feedback would be appreciated. Thank you so much for what you do with Massive Voodoo, and all they artist there. I check daily to see what ya'll are up to. Happy painting!" Sure i remember this white armour question. Wasn't there a Painting Jam about it? Uough, i don't find it anymore if there was one. Whatever sure i can give you some brainstorm while looking at your model. First, i would recommand that you start working out all areas (base, metal parts, leather) before you go into detail work. Your detail work should be some final lights in the muscles mainly i think and some more depth in the green shadows. You did very well in bringing them out but your distance in the bright/dark contrast is still between 30%~70% if we think of a distance of 100%. Working out small light situations that guide the viewers eye more. I try to explain what i mean with a little sketch. I've been lurking massive voodoo for a long, long time now, and I must say, it is a great site to find some inspiration and fuel to continue my own projects. I just wanted to thank you first for keeping the site open and running, and giving us something to look at almost every day. What I want to ask is a bit complicated. I've been painting models for quite a while now, almost 10-12 years to be exact. I've always worked with games workshop stuff, painted armies with an increasing quality at each one. I believe I've reached the point where I should stop painting armies and focus on single models to get my painting better. I think I set myself a quality cap while painting armies to get them to finish at some point, and this slows my painting improvement. I'm looking to buy several single models to start my "better quality" tries, I was wondering if you could give me some tips. Is 54mm is the way I should go? Should I stick with 28mm? Is there any models you would advise for beginning? Thanks a lot for reading, I hope you're having a good weekend! As I can see from your gaming models you are "feeling" the right decision. For sure it is always a difference if you paint up a gaming model to get your army completed in a human time line or if you do paint up a single model only for the cabinet. Don't lose your fun doing your army and take display progress as an additional aspect of the hobby - sooner or later you will see what you really like and concentrate more on the aspect your heart tells you. 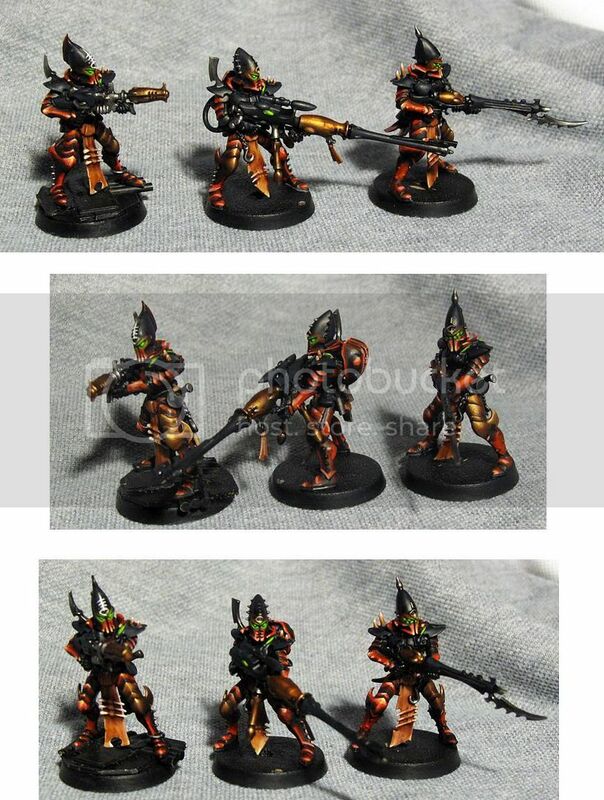 Nice gaming models btw an army in such a standard looks pretty cool i think - i just miss the bases. Do your workout and have some happy painting! Hope i could have helped the one or the other. Like your warpaint a lot, great idea with these native dots... mmh, my eyes are getting older, no washes, ok, so rock on and happy painting! Well, I thought I'd better leave a comment, so I don't come across as ungrateful; thank you for the answer, I'll see if I can get the candle-idea working. I hope I didn't seem demanding in my mail, and if I did, I apologize. What I meant was that I've been unable to find a simple tutorial anywhere on the web with some examples on how to create the light and shadow in the dark so it looks "right". - Filling out a niche usually feels good and inspiring, so I thought I'd mention it while asking for some advice (when you already know how to do it, my guess is that it is harder to notice that it's missing). Also, 700 pair of eyes are better than one haha - anyone seen such a step-by-step commentary anywhere?